Event will feature a private event space with 3 drink tickets each & catered dinner. 7 am. Registration. Complimentary continental breakfast for attendees. Final briefing, last minute questions, etc. 9 am Depart Hotel, use Metro to travel to Capitol Hill. A room will be available at the hotel to store your luggage. DO NOT BRING LUGGAGE TO CAPITOL HILL! 9:30 am Arrive at Capitol Hill. Meet on the steps of the Capitol for a group photo. There will be an opportunity for state delegation photos also. * Please do not book departure flights prior to 4:30. Since our inception we’ve conducted more than 2,000 legislative meetings with Congressional representatives. 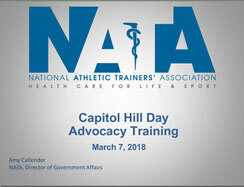 Over 75 athletic trainers from 31 states ventured to Washington, D.C., for NATA’s annual Capitol Hill Day. More than 200 meetings with legislators and their staff took place throughout the day to discuss S. 808, the Sports Medicine Licensure Clarity Act, the House version of which (H.R. 302) was passed by Congress in January 2017. The Capitol Hill Day visits led to 8 new cosponsors for S. 808. In addition, the meetings offered attendees the opportunity to talk one-on-one with members of congress and their staff, educating them on the athletic training profession and issues important to our members.